Update 2: Well that was quick! Just about a month after its release, Google is shutting down Photovine. Other products part of the Slide team have also been retired by Google including Pool Party, Disco, and Video Index. The Photovine app itself is currently still in the App Store, but will probably be removed soon. The reason given by Google is lack of interest by the public. While we are incredibly grateful to our users and for all of the wonderful feedback over the years, many of these products are no longer as active or haven’t caught on as we originally hoped. Update 1: Photovine, the photo sharing iPhone app from Google in now open to the public. 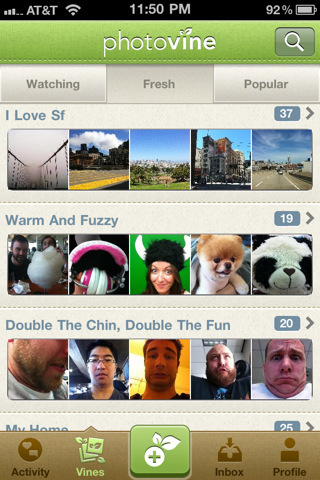 Photovine is a new social photo application for the iPhone from Google. The app is touted as “a fun way to learn about your friends, meet new people, and share your world like never before.” Photovine as the name suggests bases itself around a set of your photos connected like vines by a single caption. These vines of photos may be contributed to by you, your friends, and poeple all around the world. The Photovine app is a bit of a tease right now however since it is in invite only mode. Once you download the Photovine app on your iPhone, you’ll need to login to your account. If you don’t already have a Photovine account you can request for an invitation by entering your email address. If you have a friend who’s already on Photovine, they can also send you an invitaion to the service. AppSafari review of Photovine was written by Joe Seifi on July 14th, 2011 and categorized under App Store, Photos, Social. Page viewed 3421 times, 1 so far today. Need help on using these apps? Please read the Help Page.